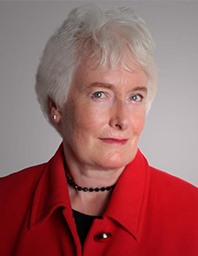 Margaret Mountford went to Girton College, Cambridge University, where she read law. She then became a city solicitor rising to partner at Herbert Smith, where she had first encountered Sir Alan Sugar when she was the senior assistant for Amstrad's flotation on the Stock Exchange. Together with Nick Hewer, she later advised Lord Sugar on The Apprentice. The Times ran a feature on Margaret Mountford which revealed how after she retired in 1999, she decided to resume her studies, including a full-time degree in ancient world studies at University College London, a part-time MA in classics and a PhD in papyrology. She is a trustee of Corda, a charity dedicated to the early detection and eradication of cardiovascular disease.